Came in a flash, swarmed like locust and zapped away in a blink of an eye. I say too bad and certainly not enough for yours truly to be satisfied. My source of dissatisfaction is mainly because up to the moment that I fell for something that really distorted my soul and mind, I want more of it and it just faded too damn quickly. Alright, enough with this, a little while ago, over my YouTube and Facebook group scouting, I found out about these German guys from Marburg, named CLOUDBREAKER. Eventually I got sucked into one of their songs that instantly captured my attention. It ended with me turning to the band’s bass player, Niko Efthymiou, with a request to review their brand new album, “Confinement Is Finite”. Rooted deep in the band’s DNA is the undying form of Melodic Death Metal. Not what you notice as the Gothenburg era, but close enough. However, similar to numerous bands, CLOUDBREAKER had to get going, move along, in order to grab folks by their ears, in the nowadays generation of Metal music. 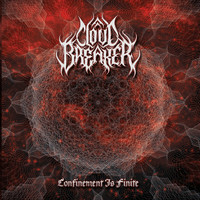 Therefore, “Confinement Is Finite” displays a band showered by the arts of contemporary progression, enabling a massive fusion campaign of extreme Metal to come up with exciting pieces of challenging music. Such a blending that is always vigilant, groovy when it wishes, and making its mark with crushing energies. Excluding several cases of pure catchiness, because we aren’t talking about merely instrumental music, the band’s songwriting swims in a sea of abnormalities, but always in a good sense, portraying a musical unit that has enough motivation to break barriers and in a manner of speaking, it worked in their favor. Early 90s Melodic Death Metal fanatics might not get into the Djent flow of PERIPHERY / ANIMALS AS LEADERS type of challenging musicianship, on the other hand, they will be drowned by the continuous blasts of mindblowing guitar melodies that will send reminders of WINTERSUN / DIMMU BORGIR / CHILDREN OF BODOM. “Confinement Is Finite”, the self-titled tune, which was my first experience with this band’s creativeness, decimated my inner being. Other than being a sucker for heavy riffs, I have also strong tendencies towards guitar driven melodies. Throughout the song I felt a constant buildup, as if it was preparing me for something, and yes it did, its last minute and a half that escalated the emotional state. “Caught In Autumn” paved its road with a darn mighty main riff, a bit simplistic for the band’s abilities, but who said that the easy stuff can’t be good? Even so, it rapidly developed into a semi-Gothic feel, especially with its harmonic chorus that is certainly uncanny for this band. “Emptiness (All That Is Left)” burst with a classic Melodic Death Metal approach fueling its soul, sharing a cold blackened sensation embroiled with the warmth of melodic agony. Others to watch out for: “CPE-1704-TKS / Light Of A Thousand Suns“ and “The Professional”. “Confinement Is Finite” is a work of art, and it had be by the neck. The musicianship level is of the highest of levels, and the music is reach with plenty to offer to those who enjoy the good challenge in their food for thought.